The latest minister to quit British Prime Minister Theresa May's government because of Brexit said Saturday that the prime minister's compromise agreement would leave Britain outnumbered and outmaneuvered in future negotiations with the European Union. Ex-Universities and Science Minister Sam Gyimah likened the agreement to playing soccer against opponents who "are the referee and they make the rules as well." May is battling to persuade British lawmakers to back the agreement when Parliament votes on it Dec. 11. She and EU leaders say rejecting the divorce terms, endorsed by the EU last weekend, would leave the U.K. facing a messy, economically damaging "no-deal" Brexit on March 29. But many lawmakers on both sides of the Brexit debate oppose the deal - Brexiteers because it keeps Britain bound closely to the EU, pro-EU politicians because it erects barriers between the U.K. and its biggest trading partner. The two-part agreement includes the legally binding terms of the U.K.'s departure and an ambitious but vague declaration on future relations between the two sides. Gyimah, who backed remaining in the EU during Britain's 2016 referendum, said the agreement was "a deal in name only." "We've got a wish-list of aspirations that we intend to negotiate with the EU (after) we've lost our voice, our veto and our vote," he told Sky News. His resignation came after May said Britain was abandoning efforts to retain access to the EU's Galileo satellite navigation system after Brexit. May said that given the EU's decision "to bar the U.K. from being fully involved in developing all aspects of Galileo, it is only right that we find alternatives." She said Britain would develop its own sat-nav system, at an estimated cost of several billion pounds (dollars). Gyimah said that "what has happened with Galileo is a foretaste of the brutal negotiations we will go through that will weaken our national interest, make us poorer, less secure." 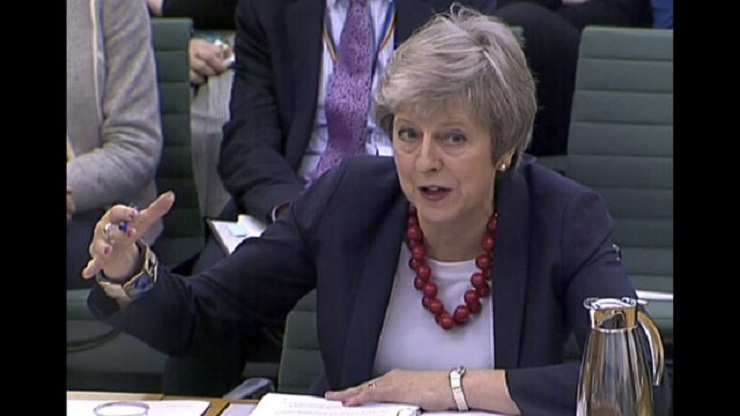 May has acknowledged the Brexit deal is not perfect, but says it delivers on voters' decision to leave the EU while retaining close ties with the bloc, a key trading partner and ally. She got support Saturday from Environment Secretary Michael Gove, a key Brexit-backing minister, who wrote in the Daily Mail newspaper that lawmakers should back the deal rather than hold out for a "perfect plan." "Does the deal deliver 100 percent of what I wanted? No. But then we didn't win 100 percent of the vote (in the referendum)," Gove wrote.